The pottery is in the main the same as had been found in the Dynasty 4 mastabas in the Western Cemetery but presents a few new specimens in addition to the model mention above. The small model pots are well made of good red-brown ware: [ILLUSTRATION]. There are red polished bowls with recurved rim and spout, round bellied jars: [ILLUSTRATION] handled jar with fine ribs, light color slip wares and red-brown wares (see object register 13-10__ to ___). [ILLUSTRATION] (Scale 1:2) Red ware (brown surface, black gray interior white specks). G 4240. Cleared between the casing and the core behind the chapel to see if there had ever been a slab stela: in the packing found fragments of large pot. G 4220. Clearing sand from east face beginning at southeast corner. On surface large limestone chips etc. Underneath drift sand. G 4340. Cleared bottom of pit behind stone. The debris was dirty limestone debris, more of less disturbed by thieves in order to lean stone inwards and mixed with small model pots and potsherds of same types as in chamber. 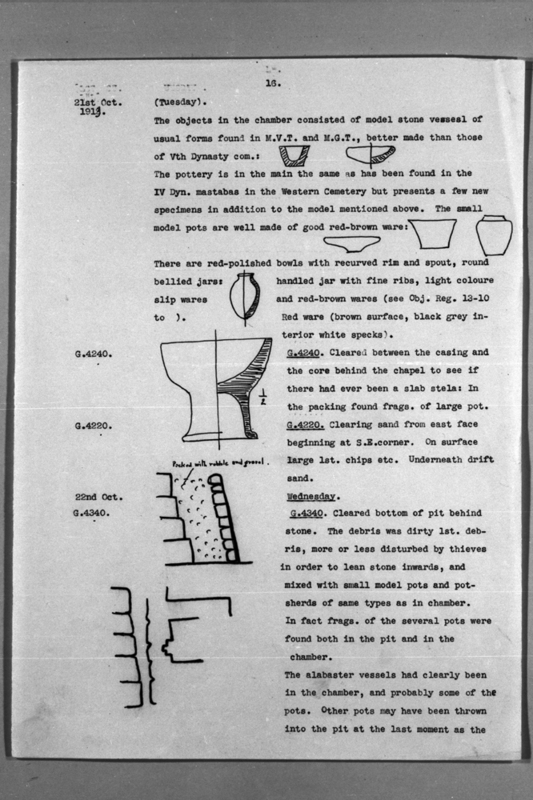 In fact fragments of the several pots were found both in the pit and in the chamber.